Here is the FoneArena Nokia C3 review – an entry level QWERTY phone which is available for purchase in UK. The phone drew plenty of attention in Indonesia when it was launched a while ago. 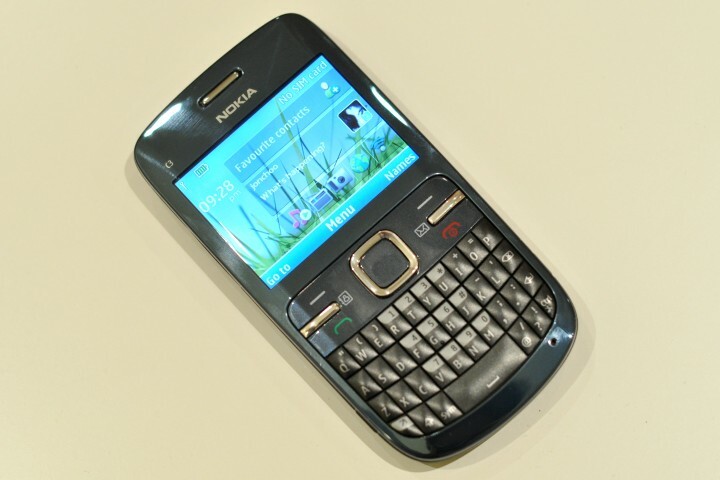 The Nokia C3 looks at first glanced like a Nokia E72, but essentially it is a stripped down phone geared towards youngsters with a range of social networking applications at its heart. For a phone that costs from £80 in Britain on Pay as you Go, the C3 has plenty going for. Despite running on Nokia’s Series 40 platform, the C3 is unusually blessed with WiFi and Bluetooth. 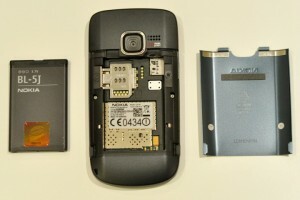 In addition to that it has a decent 2MP camera which is fine for taking web-destined pictures. If you expect anything more then you will be disappointed. It also has a 3.5mm headphone slot for music listening on the top, a standard Nokia charger port, micro USB port and micro SDHC. It is bundled with a 2GB microSDHC card. The C3 has no support for 3G, but GPRS is fine with Opera Mini. It is powered by a Nokia BL-5J battery (1320mAh) which is fine for up to 800 hours of standby time, according to Nokia anyway. 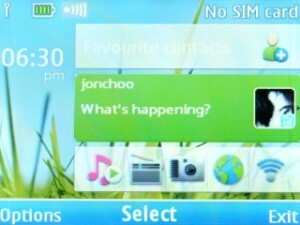 The display is a standard 2.4″ screen with QVGA resolution, and performs well outdoors. Mind, we haven’t been getting plenty of sunshine lately so I was unable to test the display under full sunlight glare – but will update when and if we ever get our summer back. Below the screen resides two soft keys, two applications keys and a call and disconnect (which also doubles as power on/off) buttons. Below those is the QWERTY keypad. 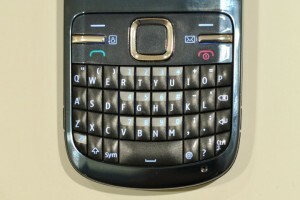 The keypad is similar in feel to the more expensive E72, though the space bar is also far larger (like the E71). Commonly used punctuations are easily accessible. Series 40 is a rather dated platform and a step down the ladder from the more versatile and mainstream Symbian Series 60 smartphone platform. It does not support multi-tasking, but it works well despite its rather dated look and use of large fonts. Opening applications can be a very slow process. The problem is Nokia should be pushing the ‘smarter’ S60 onto lower end phones like this. Nokia markets the C3 as a messaging phone for youngsters. 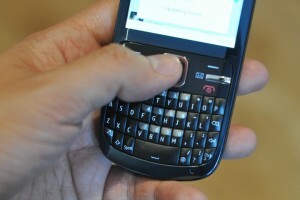 With the QWERTY keypad, typing messages is a breeze. It has support for the most popular messaging platforms such as SMS, email and popular instant messaging platforms such as Yahoo! Messenger, MSN via Ovi Chat. There is also Opera Mini 4 installed for all your web browsing need. 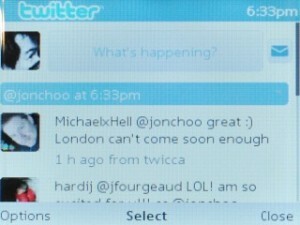 As social networking booms, Nokia has included a Communities application for Twitter and Facebook. It is a J2ME application, so loading or starting it up can take a while and it does not run in the background. It does integrate itself neatly on the homescreen though, but you will have to launch the app in order to reply. As a Twitter client, Communities has some good features, but personally I feel that the C3 is too slow to be of any use. It takes a long time to scroll through messages and replies. Anyone who follows more than 50 twitter users will likely find it a chore and would be better off downloading Twibble or using dabr.co.uk instead. The sound quality from the music player is rather good, and with a microSDHC slot and 2GB card already provided, the C3 makes for a decent music player. Equally good is the call quality and signal strength. It never dropped a call on me once, but that isn’t surprising – the telephone bit of any phones has always been Nokia’s strength. It is hard to fault the C3. It is a great device with brilliant built quality and has features many would not expect in such a cheap device. For £80 (EUR100) on Pay as you Go, you get a great looking device with a wonderful QWERTY keypad built around messaging. Shame the software isn’t up to it. Note: This review is based on a UK Retail Unit. The C3 would be available soon in more more markets including India.